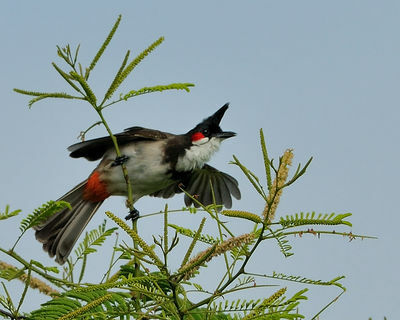 Bulbuls are a family, Pycnonotidae, of medium-sized passerine songbirds. Many forest species are known as greenbuls. The family is distributed across most of Africa and into the Middle East, tropical Asia to Indonesia, and north as far as Japan. A few insular species occur on the tropical islands of the Indian Ocean There are about 130 species in around 24 genera. While some species are found in most habitats, overall African species are predominantly found in rainforest whilst rainforest species are rare in Asia, instead preferring more open areas. The only Bulbul which occurs in Europe was spotted in the Cyclades and bears a yellow patch, being otherwise of a snuffy brown.